Thanks again for trying to come see my run at the SS. It meant the world to me! I may not have gotten to come down and ride this spring as usual ( I have been trying to show on my free weekends as much as possible), but never doubt that I credit much of my success to you and Leon. You both believed in me from the time that I bought my first cutting horse 4 years ago and came down to ride with you a week later. I will never, never forget all the support and encouragement I have gotten from you! I may not be in your pen as much as years past, but I would not be where I am today without you! I wish every amateur starting out could have that to build on! It has been a while since I spent four days with the two of you, but I wanted to write and say I think of you both often, especially when I'm cutting, and I use what I learned with you every time I ride. I remember Day One at your ranch. I was warming up the first horse I rode, just loping around and doing some stops. It wasn't ten minutes (okay, probably more like five) when Leon said, "We've got to do something about those feet." I laughed and said, "If you can fix that, my trainer will be very happy." Well, for four days I not only got cutting lessons, but horsemanship lessons for "quiet feet." And my trainer was indeed very happy when I got back to San Diego. I've continued to work on having "quiet feet." Here are a couple of recent photos that could never have been taken before I spent time with you. And I've also won my first buckle! Thank you, Leon! Thanks to you too, Alex, for letting me ride Bubba for my final three days, two of which I rode without a bridle. What an amazing horse and an incredible cutting experience; a real confidence builder! It has been almost two years since we've been to your clinic and we wanted you to know that we haven't stopped learning and practicing what you've taught us. Sadie won first place in the youth, in the Southern Colorado Cutting Horse Association in 2013, and I've even been showing as well. 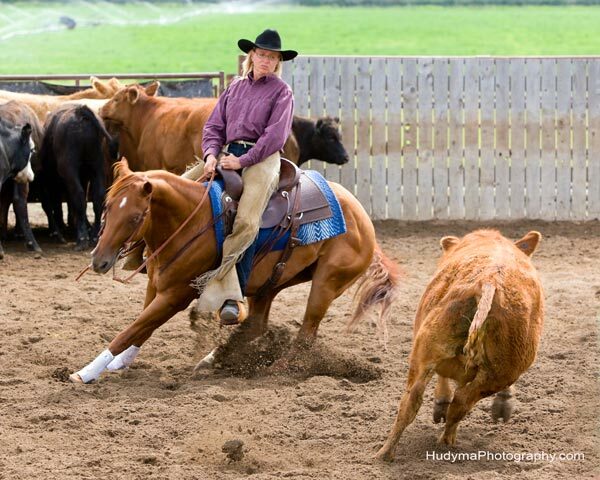 Sadie is planning to compete in the high school rodeos this year in Colorado. We can't wait to come back for more lessons. Stanley and Beverly Glover have been a great help to us both in understanding the sport and both have great things to say about you. I've attached a couple of pictures and hope you enjoy them. Although it has been almost 2 years since attending your clinic, we wanted to thank you again. We both agree that, if we are going to improve, we need to return to Springtown. Sadie needs your guidance if she is going to compete in high school and I would love to improve as well. We just need to figure out how to make it happen. I hope your having a great new year and thank you again. I would like to thank Leon and Alex Harrel for every thing they have done for us. They took Taylor into their home last summer,took her to THSRA last year. Did not charge us a dime. I see the Talent and gift this man has in my daughter's riding every day. A true gifted legend and horse lover. One hell of a man and a great friend. He helped teach her to ride her own horse and keep her correct by herself. Due to his love for Taylor she is going to Nationals on her own horse next month. Our friends forever. We love you guys and thank you from the bottom of our hearts. Not to forget what a great horse MSP Handle Me Smart is. The turn back help also is an example of the other great people in this sport, thank you guys for being so fair and helpful to all the young cutters at THSRA. And last but not least thank you to every one involved with THSRA, great job and a lot of work. See you at Nationals. Thank you, Alex. And big thanks to Leon. I had no idea how much fun cutting could be. I am hooked! I know I learned more in the past three days about cutting than I could possibly have learned on my own in three years or even thirty years!! I feel confident that Bubba and I will get along great with Leon's lessons and your guidance in purchasing a horse. My horses have appreciated Leon's input as much as I have! 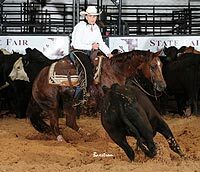 I have a 7 year-old Peptoboonsmal gelding, Peptos Smokin Hot, and a 6 year-old Mecom Blue daughter, Lil Kitty Mecom Blue, both were bred and professionally trained in Texas before heading north. They have responded really well to the techniques that Leon passed along and I'm looking forward to a good season on them this year. I have been a ski instructor, windsurfing instructor and have certified other instructors in both sports. I taught junior and senior high school prior to my business career. I understand and appreciate good instruction and I know that being able to do something very well, doesn't mean someone can show others how to do something very well. In fact, it's often the opposite! Someone who is a 'natural' often doesn't understand how they do what they do, they just do it. Leon has the rare ability to perform at the peak of a demanding sport over a long period of time and yet to be able to evaluate riders and take them from where they are to a higher level of understanding, confidence and performance. He does this with grace, humor and insight. The quality of the horses was incredible and the three days flew by. I will definitely be back for more 'tune ups'. I know that you and Leon are quite aware that what you are doing with your program is very unique. I am so glad that I was able to 'discover' it and to take advantage of this 'once in a lifetime opportunity'. The best thing is that it doesn't have to be 'once in a lifetime' and I'll certainly try to be sure it isn't! Thank you, again, for the great experience and keep doing what you're doing! When you hear that name you think of the numerous world titles and futurity titles. The legend, but when I hear Leon Harrel I think of much more. Someone that you can look up to as a role model in and out of the arena. Someone who can put those boys who are on T.V with shows of natural horsemanship to shame in real life. 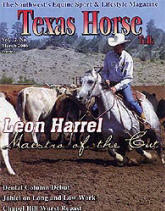 I will tell you LEON HARREL IS THE BEST HORSEMAN I HAVE SEEN. and there is no better person to learn from than Leon. I have had the pleasure of riding with Leon and seeing first hand him work miracles with horses by just the pat on the neck. The softest touch gets him so far. I thought I was a great rider until I came to him, he taught me little things that I wouldn't normally think of. Things that made me a better barrel racer and a better listener to horses. Not only is he a wonderful horseman he is a inspiration to everyone that has any hope to become something special whether it is in the arena or the arena of life. He taught me to just keep going and take every opportunity that horses give you, and run with it. and yes there will always be disappointments but it's how you handle them when they come your way. You might not always draw good but Leon will tell you best, you can always win on that paint heifer that no one wants to cut. you will never know unless you go for it. He has taught me so much that i will remember for the rest of my life. Leon Harrel has made a huge influence in my life and I wouldn't trade one second that i got to have riding with him or talking with him for anything. He is a great man, and horseman. Please convey to Mr. Leon how thankful I am for what I learned. I hauled my horse last evening to start tuning for a show later this month. Confidence in entering the herd felt so good. As an amateur, nervousness plagued me, but now it has lessened and I am more relaxed. 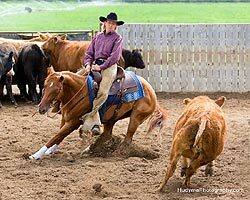 After riding your horses for 3 days and then getting back on mine, I could "feel" the horse cow and just let it happen. After riding off and on for a while, with and without a trainer, in just three days with ya'll I gained so much experience and knowledge in herd work and position on a cow. For the first time, I really believe that I can attain my dream of cutting. Many trainers do not have the time or ability to convey what needs to be taught effectively to an amateur. Traveling to your facility was worth every penny. 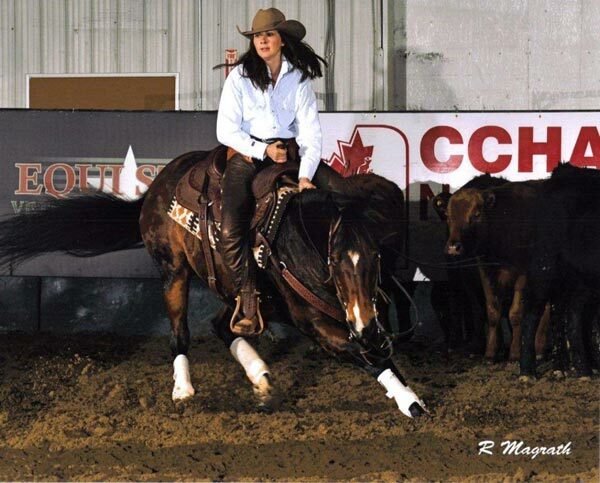 I look forward to returning for another clinic and putting the knowledge I gained to use in the show pen. I first wanted to say how thankful I am that you and Mr. Harrel had me at your place to train! I learned so much! It reassured me that my love for this sport is real. Mr. Harrel makes learning how to cut so simple. He also maked it so fun. He was so good at reminding us that this was to be fun and about learning and messing up was a good thing so that we could learn! Once he reminded us to relax and just do it and have fun with it, it became so much easier and I myself was able to learn so much more! This was the best experience and well worth it. I really do hope to get to come back and train with Mr. Harrel again in the next year! Thanks again for all y'alls help and support! I just wanted to send you the latest photos from my week at the Non Pro. I had many great runs and made the finals in the 15,000 Amateur. I cannot thank you enough for all that you have done for me. I first came to ride with you 3 years ago when I first started cutting. Since then, I have been lucky to be able to visit you 3-4 times a year. It has made an amazing difference in my riding. Coming to work with Leon, in addition to the help I get from trainers back home, has allowed me to take my riding to a level I never thought possible. Leon was the first person who believed in me and gave me the confidence to keep working hard at this sport and never, ever give up. I want to thank you Leon for taking me to the next level. 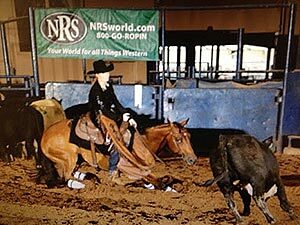 The thrill of coming in 7th in the NON-PRO at the 2012 Western Nationals in Reno was something I never thought I would feel. I have a great horse but I was not showing him well enough to win. Leon, making the decision to come to you a year ago and sticking with your program enabled me to really "Show" my horse to his full ability. Your coaching - both in technique and self-confidence - was the key. Thank you most of all for making it fun for an old dog to learn new tricks. Thank you so much for making our trip to Texas nothing short of perfect! I learned more in four days with Leon than the whole 18 months I have been cutting. Leon definitely brought the joy back and took the drama out. Thank you! He is so encouraging, professional, and easy to follow. Your horses are amazing! I love that they all love their job and look forward to working each day. I can't wait to show using my new skills... Oh thank you also for the amazing spa, restaurant, and shopping recommendations. They were top notch! Again, thank you from the bottom of my heart! It was a privilege to learn from a true master of the great sport of cutting! Sadie and I wanted to drop you an email to thank you for the time we spent at the clinic. Your teaching completely changed the way we looked at cutting. 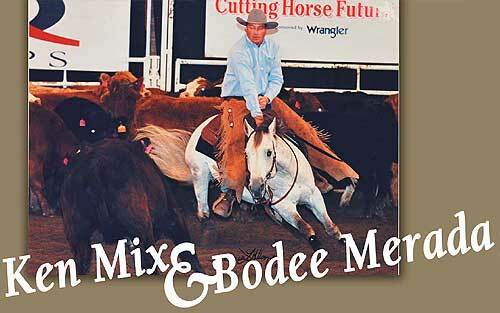 We found a Blue Duck Okie x Smart Mate mare that has been competed and won, in cutting, at High School Rodeos. 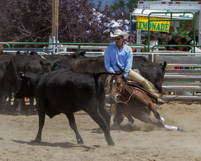 Sadie plans to spend the next year learning, practicing and gaining confidence then began competing in the Colorado State High School Rodeo Association. This clinic was such a great experience and Leon, you are wonderful with kids. Sadie cried when we left your ranch because she said she was going to miss Leon, Sap and Chip! I thank you for allowing me to help out and not just sit in the stands with a video camera. I got to watch my daughter learn, listen to your instruction and ride the best horses I've ever been around. We plan to apply the things that you taught us, gain experience and confidence and return to your clinic for the next level of training. Right now she is doing exactly what you told her and just riding, riding and riding. She's building a trust relationship with her new horse and improving her riding skill by doing anything she wants to on horseback. I've written a testimonial in case it is of any use to you. "Taking my daughter to Leon's clinic was the best step we could have taken toward advancement in cutting. He treated my daughter like one of his own grand-kids and she feels the same way about him. I could not have imagined a better experience for her learn. He had a way of calming the nerves and educating in a way that let her know that it was okay to make mistakes, have fun and learn all at the same time. I would recommend these clinics, without reservation, for any level of cutter. I contacted Leon to teach my daughter but I quickly realized that I have a lot to lean myself. So, I plan on participating in the next clinic we attend. Outstanding horses and outstanding horsemanship!" Thank you Leon, what a great experience! I just wanted to say ‘thank you’ again for ...the best experience ever! It was everything you promised and more. 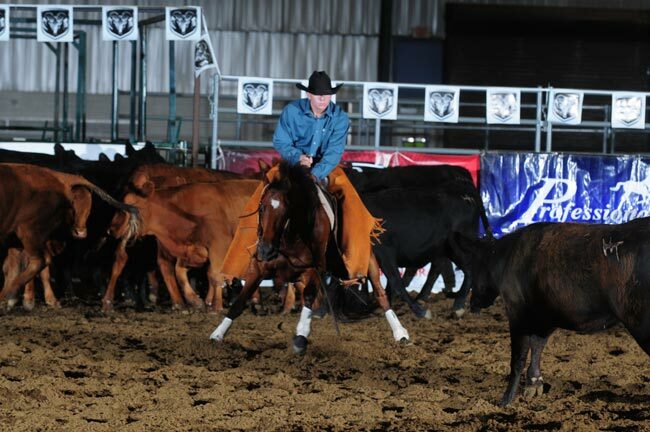 Your program has to be the best 3-day learning experience in the Cutting Horse Industry. I had the best time while learning so much about cutting. 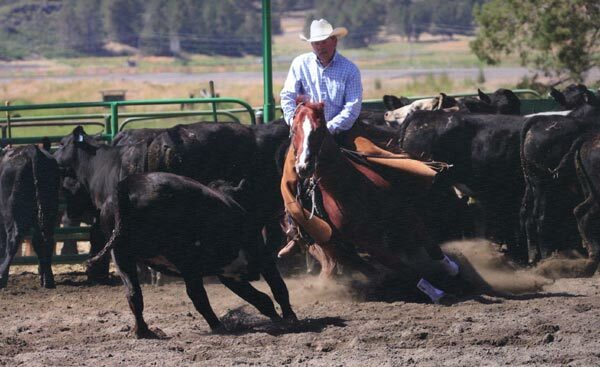 Your horses are excellent -- quite willing, and perfectly suited to giving riders at any level a real-world learning experience – even the cows were perfectly suited to that task. The training I received was everything you promised and more. Your facilities are excellent and the staff warm, friendly and hospitable. I felt quite at ease and relaxed so it was a great learning environment for me. Thank you again. Now, I saved the best for last! Have you ever read one of those interviews of famous people where the Interviewer asks the question, “If you could choose anybody, past or present, to sit and talk to around a campfire, who would it be?” In my lifetime I have worked with and studied under some of the best college professors and corporate leaders who ever lived. As a trainer, teacher, and coach Mr. Leon Harrel could sit with the best of them and they would consider themselves fortunate to have his company. His method of teaching and style of coaching is patient, encouraging, disciplined, confident, and obviously extremely knowledgeable. His mastery of cutting is evident from the moment you step into his pen. What comes later as a pleasant surprise is how easily and willingly he transfers that knowledge to his students. 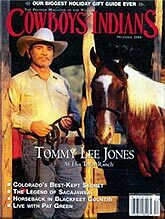 I think I would enjoy sitting around a quiet campfire listening to Mr. Harrel talking about the Cutting Horse Industry and his lifetime of achievements within it. It would be my pleasure to be one of his students again. Thank you, Kind Sir, for just being the teacher you are! Thank you both for a wonderful experience this past week. Your training program was everything I had hoped for and more. As you know, my riding background consisted solely of riding hunters/jumpers, which I didn’t start until my early 30s. I am in my 50s and hadn’t ridden in the last 7 years before taking some cutting lessons this past summer for a couple of months. When I came to your program, I had experience on the flag, but only one day’s prior experience with cattle. This sport is so much fun; that’s a given. However, the progress I made and the amount I learned this past week was amazing. I learned so much about reading cattle – the first day or two, I was just hoping that there would be a cow left in front of me by the time I rode up through the herd. By days 4 and 5, most of the time I was able to cut the specific cow that Leon suggested. Also, my rein hand got much more quiet – I thought it was quiet at the outset, but looking at the videos, I looked like I was trying to flag a cab the first couple of days. By the last day, my rein hand had quieted down while driving the cow out and once I put it down after wards, it was almost always on the neck except when I consciously wanted to make a correction. At the beginning of the week, everything felt rushed and sudden and I was holding my breath, but by the end of the week, everything felt so much more smooth and fluid and I was breathing normally. All of your horses that I rode were amazing; what an opportunity to get to ride them. I also enjoyed getting to meet and ride with a very diverse group of clients this past week. Leon does a masterful job of putting everyone at ease and giving them confidence in this sport, regardless of their background or personality. Thank you both for making this past week a confidence building experience while also making it so much fun. I thought this would be a one-time experience, but now I plan to be back for at least a day once every three months or so. I bought a horse 5 years ago without any knowledge of riding or horsemanship, I had a lot to learn!! It was very apparent following a year and a half of struggling, that the horse was definitely more than I could handle and I needed some instruction. I had not even heard of the sport of cutting. I was fortunate to find a local trainer who was willing to work with a complete novice rider and a green horse. After several years, my trainer encouraged me to purchase a finished cutting horse and “step it up”. I did so, and with her assistance found an amazing horse the summer of 2009, the excitement began! 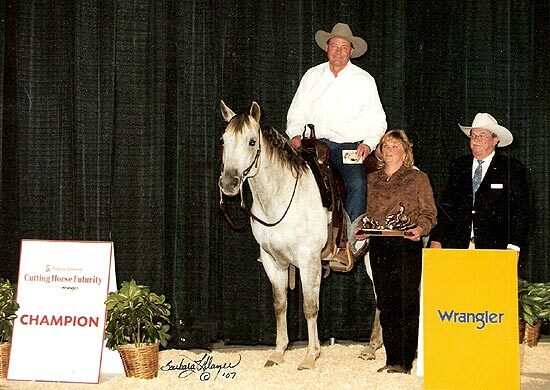 I attended a Leon Harrel clinic last summer (2009) in Alberta, shortly following the new horse purchase. Excited but still struggling to figure this new horse out, it was a big step to take. The instruction was outstanding! Leon’s communications skills with the clinic’s participants made my apprehension disappear. Following the clinic, Leon kindly spoke to me, encouraging my continuation with this exciting sport and that I could accomplish anything that I wanted. I followed the clinic with a trip to Leon’s training facility in Springtown in January 2010, it was amazing!! I felt that my goals for competing were attainable, but what where they? 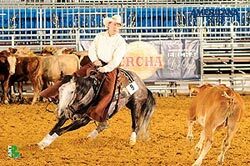 So I made a list, a sort of “bucket list” that included my ultimate goals of competing; one in a bridleless competition and another as a Non Pro at the Calgary Stampede. I continued to work on improving my riding skills, my relationship and trust with my horse and the mental concentration required to be competitive. By concentrating on showing my horse to the best of my ability rather than focusing on a score, eliminated much of the nervousness I had previously felt. 2010 has been a wonderfully exciting year for me! I started the year out by placing 4th at the CCHA Finals (2009) 5K NH/NP in the Spring. I attained both of the 2 goals on my “Bucket List” this year by winning a Bridleless Class with a score of 76 and making it as a Non Pro Finalist at The 2010 Calgary Stampede (9th). This year also brought a Championship in BCCHA 5K NH/NP class , 2010 Reserve Championship in CCHA 5K NH/NP, 6th in the 15K NH/NP class, and was awarded my NCHA Achievement Buckle. I have qualified for Western National Finals in Ogden for the 2011 Spring Event in both 5K and 15K NH/NP so will let you know how that goes. I have been extremely fortunate to have had some great people assist me, forming new friendships with this wonderful team of cutters. Leon’s encouragement and instruction has allowed me the confidence and ability to compete in this amazing sport. Leon, just wanted to thank you for the wonderful time we had while riding with you at your ranch. It was such an honor to be able to learn and ride with you. We both learned about the importance of good horsemanship, learning to use our legs correctly and keep our hands more quiet. Also, I feel that we are starting to get a good grip on reading the cattle. We have only been into cutting for about a year and you taught us so much in one week. You are truly an honest and humble mentor who really enjoys his job and cares about his animals. We really enjoyed watching you work with your young horses and the ones that you were rehabilitating. We were really impressed with your quiet, calm, patience with those horses and it was very obvious that those horses trusted you. 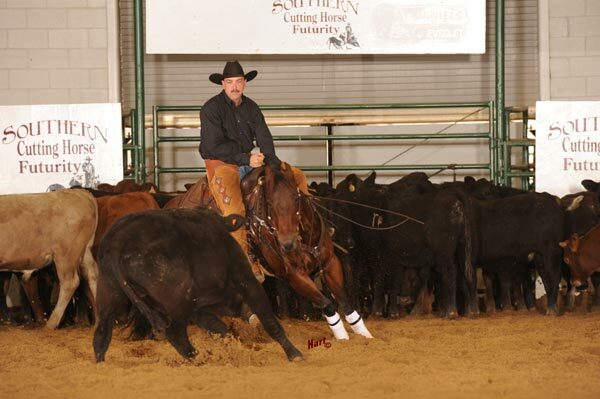 You are just an exceptional trainer, horseman, and person and truly give the sport of cutting a great reputation. I am so excited about my young mare that I bought from you. For me, she is a dream come true. I want to be able to develop that trusting, quiet relationship between her and I that you have with your horses. Also, thank you for that wonderful video "Riding to your Full Potential". We've watched it about 3 times now and it is full of really excellent info. It reinforced so much of what you taught to us while we were there. It will definitely be a good reference when we are practicing and showing. I just want to thank you both for the great time I had with you both on my visits to Springtown. Making the transfer from polo to cutting was much more challenging than I expected. Riding western to start with was new for me, and then cutting is totally the opposite of polo ... hand down, sit down, sit back. If I had not found Leon I do not think I would have continued cutting. In my first week with Sappy and Ringo, I had total confidence in letting them cut and learning that if I keep watching the cow and make my feet come alive then little could go wrong ... except, and I am proud to claim this title, when I became the first to fall off in Springtown. Such was my confidence in your wonderful horses that I got straight back on and carried on! When I came home to Colorado and started to work with Chicaro, I quickly realized that there was one essential step needed ... Chicaro and I to both come to Springtown. That was the best thing I did. We learned so much together, and most importantly I learned to trust and really enjoy him. It was great on the first day when he showed Leon all the worst tricks he had been pulling with me. He is way too smart and I think his hobby is to think up his next cheat! With Leon’s help I learned to trick him and make him think that it was not me on his back. I am so proud of my pony and keep thinking of Leon’s assessment of my horse. The first day he said he was well trained. Second day he said he had also been trained for showmanship. And on the third day after I had cut, Leon said there was no need for him to ride him and that together if Chicaro and I still keep making the progress we had in that week we could become competitive. I have been cutting most weekends since I came home, and we have been getting better and better, I have attached some photos to show you our progress. I am so addicted to my new sport. I love cows! I could not have possibly found a better place to come and learn the basics of cutting and make the transition from polo. Thank you both so much. I am looking forward to coming back in the spring for a full week and taking Chicaro and I to our first show. What makes me smile is that I bought Chicaro for $3k and have since spent more on my saddle and training than my horse. But, with Leon’s help I have learned to really enjoy and trust my horse and love cutting on him. I wanted to say a big thank you to you both as well as Garrett and Chance for making my time at your ranch such a fantastic experience. Being welcomed into your beautiful home with the great hospitality you all provided made it feel like it was my home away from home. It was a great privilege to be able to come and ride with you, on your excellent horses, at your great facility. I am very grateful to you for not only the amazing wealth of knowledge you shared with me over the week but also way you shared it. Being taught to cut by you feels more like having fun with friends than a having lesson with a trainer. What a great environment to be learning in! The 6 or more horses that I got to ride while I was there were all outstanding and I am forever grateful to them. They have given me an experience that I will never forget and taught me the feel I need for a life of successful cutting. Coming home to my own horses I now know the feel I am looking for. Which has allowed me to help them exactly where they need it. I have been seeing improvements in their style each day thanks to what I have learnt there with you. Thank you for giving me the experience and knowledge that has put me on a pathway to future success. I gained more confidence in 3 days with Mr. Leon than I have ever had. Riding several nice horses made me confident that I can do well in many different situations. I was very fortunate that I got to bring my own horse as well. The advice I received about him has already improved our performance at shows. I'm so grateful that I had the opportunity to ride with Mr. Leon and hope that I will be able visit the Training Center again soon. 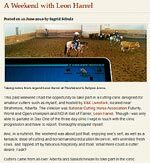 I have been meaning to write and let you know how much I enjoyed the training sessions; thanks to you Leon, I have made significant strides in improving my confidence and getting my horse across the pen. My scores have been more consistent too. I am your best advertisement to anyone who will listen…I keep hearing your voice saying “go in and cut another one”…It was such a blast. 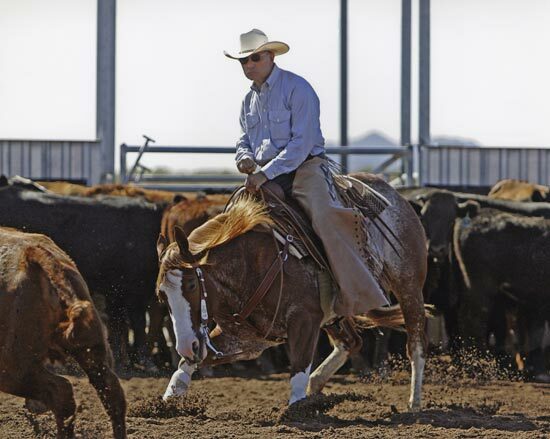 Great horses…plus world class instruction. I’d just like to say, you are one of the finest horseman and greatest teacher that I've ever had the pleasure of knowing and learning from in the cutting industry. You’ve been a great leader in promoting this industry, especially through the eyes of the amateur riders just getting started. I know because I am one of those amateurs who greatly appreciates all the horsemanship and fine cutting points you have been able to pass on to me through your easy way of teaching cutting 101 to beginners. You took me from my first clinic to my first competition with amazing ease. I didn’t even realize I had gained that much cutting ability and confidence until I was leaving the arena after my first run. I was on top of the world! Thank you Leon for all you have given and continue to give to myself as well as the rest of the amateurs in the cutting world. I always look forward to riding, learning and laughing with you. Just wanted to drop a note to tell you how much I enjoyed my time with you at your ranch. My training with Leon was extremely helpful. This being my first year riding cutting horses I can honestly say my time with Leon has definitely advanced my riding and knowledge of cutting. I thought I had gained so much from watching Leon's new cutting video, but to experience it first hand changed my whole outlook and excitement for cutting. Thank you for the opportunity you gave me and your gracious hospitality. I took some vacations and spent the last two weeks studying your video and tuning up my horse on the mechanical cow and on real cattle. The goal was to get smooth, precise and elegant moves and proper positioning. I wanted him to "listen" on my leg work. I practiced a lot leg coordination. The right message at the right time. This last week-end I went to France to an international show where the top notch men and women from France, Switzerland and Germany shows up. I started in Non-Pro , 10k limited and 3k limited. Guess what, I brought two checks home and made my highest score with this horse. The judge told me later: " this is the most elegant and clean cutting and work I’ve seen this year. I couldn’t give you more because you were not "spectacular". If you speed the whole thing up, you gonna be right there. Your video really works and helps me a lot. So I am very happy with my week end and I’m going to work now on the "show" part and keep on building muscle.. Of course Peptos Stylish Fool deserves a week off after this busy period. After all he’s only five. On my part I need to work on positioning the horse right after the cut. I found out that he really needs the best possible starting position for his work. If I’m not in the right position from the start he’s is not (yet) experienced enough to correct that himself. I am working on my training and showing program for 2011. One sure thing is that I shall attend the Mercuria World Series in Lyon (France) and the European Championship and the European Masters Cutting in Germany and the German International Championship. I know it's going to be a big challenge. However, last year was a very successful year: Out of 12 shows, I had 7 wins and 5 second places. There's nothing like a good foundation. And that's exactly what I got with Leon. That’s all for now. I wish you all the best. Thank you so much for extending Mike and I such hospitality during our recent visit. We obtained so much information, so succinctly put, that will aid us in our riding. Mike was especially encouraged in his riding and with his horse. Wayne and Just Add Cattle "Jac"
Just wanted to drop you a quick note to let you know that I am completely in love with Jac. He is everything and more than I ever imagined he could be. I haven't found a flaw in him yet. Don't think I've ever been around a horse that is as loveable as he is. He follows me around like a dog. He is so dependable. Today Wayne had a great flag lesson on him. He got off and we put our five year old granddaughter on him and he was a perfect gentleman. Both our granddaughters ride him. They're 8 and 5 and I don't worry he'll do something stupid. He's very patient. We haven't taken him trail riding yet, but I'll bet he'll be great. I haven't really had much of a chance to show him because Wayne's horse became lame and I didn't want him to lose his standings so I told him to finish up with Jac and Jac has done well. Wayne's first time showing him he marked a 74. I think that's when I lost Jac to Wayne. Next year I think I'm going to show in the 2,000 rider and Wayne will show in the $10,000 Am, both of us on Jac. For only having had him since the end of April, we've done really well on him. I won a buckle; Wayne won a jacket; he's won both the 500 and the 2,000 and placed 2nd or 3rd consistently. I think that's pretty darn good for a couple of green cutters. Thought you'd like to know that he's happy and we're happy! How are you?! I hope that Leon has rested and is very well. Here he works too much and it helped very much all those that made the clinic. We passed many pleasant short whiles. I hope that they are repeated and that you also accompany to us. I believe that the clinic was a success for both, a lot of people knew him and they were fascinated with Leon and they are going to go to your ranch to take more clinics. Please give thanks to Leon to worry about the problem that I have with my horse Dulces Instant, I must tighten it too much because the saddle is always rolled. Please, let me know when you know about the shipment of the Neoprene and say hello to Leon from my part, and I hope to see both of you before the Summer Spectacular. 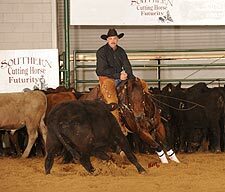 Terry Randall and "Cat's Curly Kitty"
There is no question that I have one of the best cutting horses around. Kitty has been an absolute joy to own and show. In the past 18 months, we have won many shows and year end awards. This year we did very well at the World Finals and the Western National Championships. Leon and I actually owned Kitty together for a while and then I bought her entirely so that I could start to show her myself. I was not sure that I could handle such a high powered horse, but Leon was very encouraging and helped me to get comfortable on her. He always said we were a good match and that has proven to be true. In the initial purchase and the buyout, Leon made sure that I was fully informed about the horse and the deal. I was treated totally fairly and paid a high, yet, reasonable price for a great mare. I could not be happier with Kitty and with my business dealings with Leon. I have always enjoyed learning from Leon and look forward to maintaining a long relationship with him. "I would like to take this opportunity to give some special thanks to Mr. Leon, because I have participate in the best cutting clinic of my life! and I felt very happy to hear and learned so many good things and experiences from Mr. Leon, including, some philosophies of life applicable in cutting...!! And that´s so great, because he made me learn to focus in "Those little things that makes big differences" applicable in cutting and life too. I feel very graceful because i had had the opportunity to learn cutting from him, a Big Master, Teacher and Friend..."
P.D. : I'm looking forward to ride with you again! I have had the privilege of attending 3 clinics with Leon Harrel. From my first visit in Temecula and subsequent visits in Bend, Oregon and Calgary Alberta I have been impressed with the level and intensity of instruction from Leon. From novice to experienced rider, beginner cutter to seasoned weekend warrior, the pointers and tips you receive from a master like Leon are second to none. Leon’s personal touch and patience interacting with students of the sport of cutting are unparalleled to any thing I have experienced. After attending my first clinic with Leon, I purchased one of the horses from the program that he had paired me with. Best investment I could have made and I have received numerous compliments from my peers in the sport here in Canada on how my skills have improved over the past year. I highly recommend to any enthusiast to take advantage of the vast experience Leon has to offer as it will only improve you skills. Leon is honestly the most effective, and kind trainer I have ever had the pleasure of learning from. Working with him for several months straight has put me way ahead of the competition and I have been able to get a behind the scenes look at the man Leon truly is. His honesty, practicality and genuine concern for the horse and rider allows him to match riders with the right horses that not only take the cutter to the pay window, but also keeps the horse sound, happy, and healthy. Working in his barn was such a pleasure because I got to see horses and riders become partners before my very eyes, and then go off to bring home checks at the shows. Leon matched me with my first show horse, completely within all the specifications I asked for and more specifically, she was within my budget. Leon always has integrity and is attentive to your needs as a rider. I since have sold my mare and I am looking to move up, obviously having Leon help me find another good match. I wouldn't dream of working with anyone else. As you know we love Bodee. Up here, everywhere Ken goes, he is a “super star,” and I tell you no lie Alex, everytime Ken comes out of the show pen, people come up to him and say what a nice horse, and we tell everyone how proud we are and who we got him from, if you have anyone who wants a reference you give them our number. 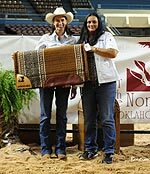 I purchased a wonderful 5 yo gelding from Leon and Alex in 2006, and 3 months later, I went to Las Vegas, won the Amateur Division, and took home a check for $65K after it was all over. Leon was right there every step of the way for me. 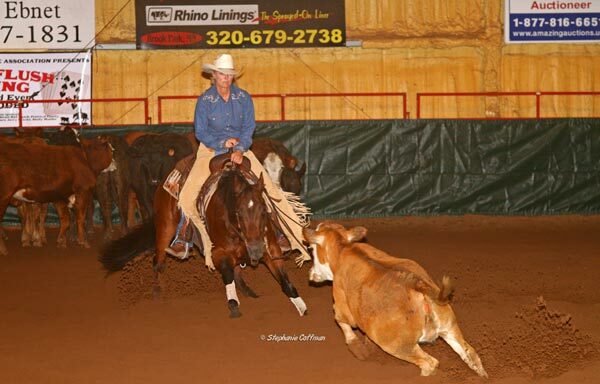 I have gone on to win many more championships and checks since then with Red, (Million Oaks), and he has been 100% sound and healthy since the day I bought him. I would not hesitate to go through Leon again when the time comes to move up. I enjoy the peace of mind knowing that his genius was behind this perfect match, and I’d trust him to do it again. Wess and I had the opportunity to take our very first cutting clinic with Leon back in May of this year. We had always ridden ranch horses and worked cows, so cutting seemed to be the next logical step. It was an incredible learning experience and confidence builder. By the end of the clinic we both were hooked. Following the clinic Leon and Alex invited us to come to their ranch and spend some more time training with Leon. We took them up on the offer and asked them to have a look for some horses that would be suitable for us. Prior to our arrival Leon had selected a couple of horses for us to try out. 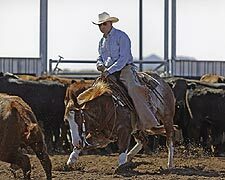 We spent the next 4 days training on these horses and working cattle. Leon was always positive and encouraging. We never once felt unable or inadequate When we looked back on the video of our first day and compare it to our last the difference was immense. We were reading our cattle better and cutting better. By the end of our stay we had decided that we really wanted to get serious and decided to purchase the horses that Leon had found for us, Smart Preppy Jae Bar and Deep River Hickory . Alex worked with us to get all the paper work together so we could get them brought back to Canada in time for Leon’s next clinic K & K in Strathmore, AB. 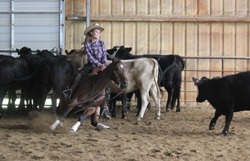 At the Aug clinic at K & K in Strathmore we refined some of the skills we had learned in TX. We left the clinic feeling confident enough to start competing. We really want to say how much we appreciate the encouragement, caliber of teaching, the knowledge that Leon has passed on to us and Leon and Alex’s friendship. We encourage anyone wanting to achieve more in cutting to spend some time training with Leon. It is well worth the investment and you will not be disappointed. Hi Leon and Alex, I just wanted to let you know how much I enjoyed your clinic in Strathmore, AB. in April/08.I was very unsure about going to a clinic with someone of your caliber teaching it, but it was very much more than I could have hoped for. You are a very gifted teacher and seem to be able to understand what each person needs to succeed. 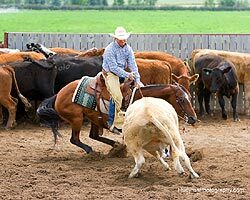 I have always loved cutting horses and think that they are the ultimate in what a cowhorse should be. Thanks for encouraging me and helping me with my self-doubts about my abilities to show in this sport. My husband tells me that I came home with much enthusiasm and I need to follow through and go to some shows this year. I think I will need more than one clinic to bolster my confidence but I am so far ahead of where I used to be. Thanks again for all your help and encouragement. I hope to see you again in the near future-maybe in August in AB. Thanks again for your kind and thoughtful ways of teaching and encouraging. "I couldn't have done it without all the training and knowledge I got from Leon while I was with the team. I would never have dreamed of trying to do it on my own. Any success we had this past year is a real testament to what a great teacher Leon is. I really value the time I had with him. In the end it was time for me to move on, but I will always be thankful for the time I got to spend with him as a student." "I had the pleasure and opportunity to take a clinic from Leon last year in 2007. I received it as a gift from my wife. I talked my buddy into joining me. As said prior, and in other testimonials, you will not find a better instructor in the industry. After taking the first clinic, we had the time of our life improving our riding skills, and just having great fun. After the first clinic, we left there like leaving an Amway convention – high on life and ready to conquer the world, or the cutting horse industry anyway. We were so hooked that we went back in June for another dose. Then we had Leon come to Canada to do a clinic at our place just outside of Calgary. The amount of knowledge that Leon passes on is absolutely amazing and words cannot express how you feel. 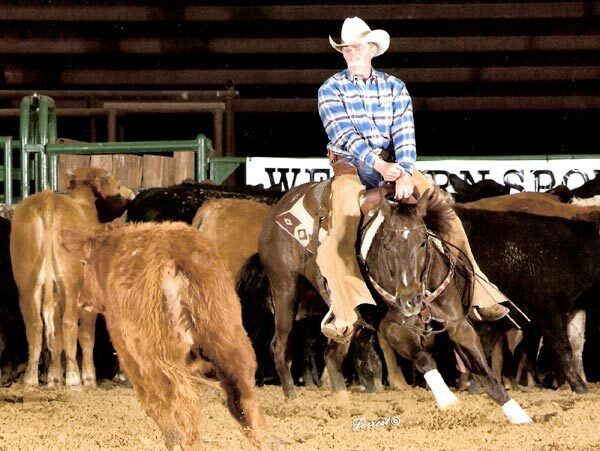 Leon has the ability to take each person, no matter what level of rider, and progress to where you have a great understanding of cutting horsemanship skills. Cutting takes a lot of dedication and commitment. If you’re looking to gain more experience in a short time, I highly recommend spending some time with Leon." John Beman and "Joe's Last Lena"
"I just got back from a week at Leon’s and Alex’s new place in Springtown, Texas. It is a great cutting horse facility in a wonderful cutting horse community. 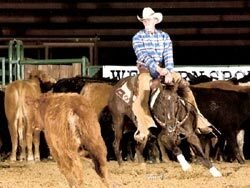 Having been to several of Leon’s clinics in Texas, Colorado, Arizona, California, and Oregon, I can truthfully say from personal experience that the one common denominator in all of these that has given me the confidence and ability to compete in the cutting horse arena is Leon’s expertise in training both horse and rider producing a competitive team. His constant positive attitude and encouragement is exceeded only by his skill and knowledge of the cutting horse industry. When I came to a clinic without a horse he was able to match me with one of his horses to fit my ability level and riding style. If I brought my horse, he trained both me and my horse raising our performance level as a team." "Working with Leon Harrel the past few years has been one of the best experiences of my life. Leon is a great teacher and his personality and teaching style have made learning a pleasure. His positive attitude and upbeat personality shine through in the way he teaches and in the way he treats people in general. My riding skills, cutting skills and general horsemanship have improved dramatically since I hooked up with Leon. I have been fortunate to be able to spend several days working one on one with Leon. Those days of personal attention and concentrated learning were a huge help in my development. The skills, knowledge and confidence I have gained have allowed me to become very competitive on a very talented horse. 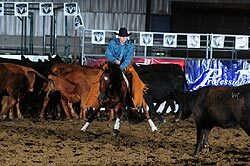 I have gone from a “club cutter” to qualifying for the NCHA World Finals in three classes. No matter how laid back or competitive someone wants to be, they can learn and have fun doing it with Leon." "I had the honor and privilege of attending a clinic with my lifelong hero Leon Harrel recently, and I have to say, that he is a magician extraordinaire! I never dreamed that anyone could so completely transform my life in such a short time. My beautiful and very expensive new mare and I were doing pretty good, but we just weren’t quite as “in sync” as I wanted to be. The trainer I bought her from simply didn’t have the time for us, and I searched and searched for someone who could put the “finishing touches” on us. Then I happened upon Leon’s website through the NCHA’s cutting clinics page, and was amazed to find that he was right in my own backyard! There are no coincidences and I feel truly blessed to have the “Master” himself so accessible to help me make my dreams come true! Thank you Leon for giving me everything I always dreamed of, finally!" 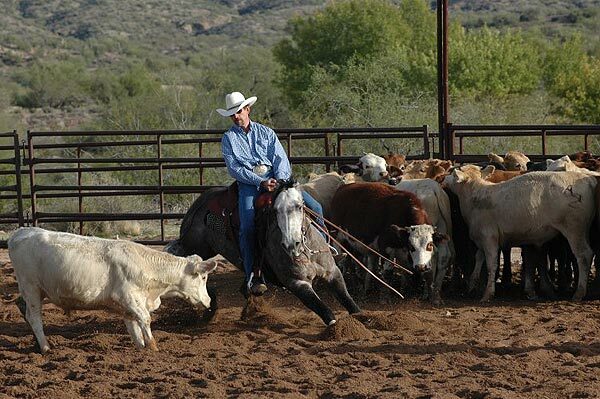 "I attended Leon's Intensive two-day Seminar on March 1-2, 2008 and learned more about Professionalism, Horsemanship, Compassion and a True Understanding for Horses and Cattle than I had previously learned in the past twenty years. Leon, Alex and their entire staff were awesome and made my out-of-state commute and stay a breeze! As an added bonus to all of the great wisdom that Leon imparts to you regarding the Art of Cutting, you get to listen to Leon tell some of the best stories about a few of the Horse Industry Legends. Hopefully, some of those legends, who are still with us, are also telling some stories about the Legend who's seminar I attended. Leon is truly a gentleman! 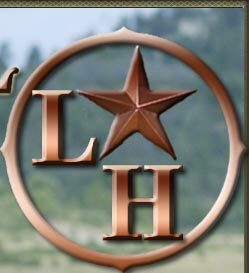 I highly recommend a trip to Leon's wonderful facility in Springtown!!!" Patti on Sweet Sugar Boon. I've attached a couple photos. 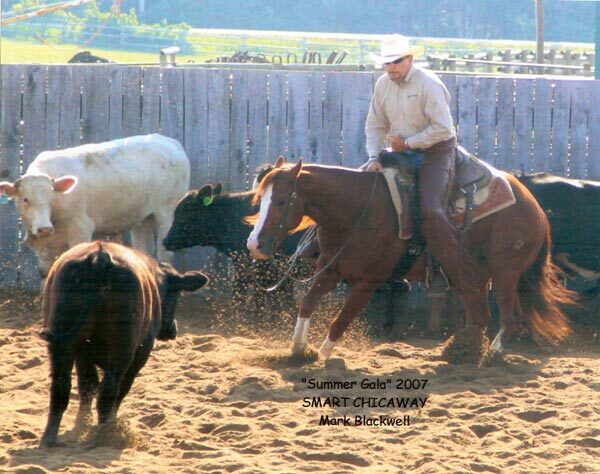 One is Mark on our stallion ~ Smart Chicaway ~ last summer. the second is me on our mare ~ Sweet Sugar Boon. 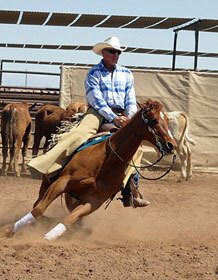 Both Mark & I took Leon's clinic ~ Mark in Pagosa Springs summer of 2006 and I joined in October 2006 in Temecula. We both took the clinic before we started showing cutters and boy did it make a difference! Our first season we both got our achievement buckles and both won several classes in Non Pro, 2000 limit rider, 10,000 and 50,000 amateur. 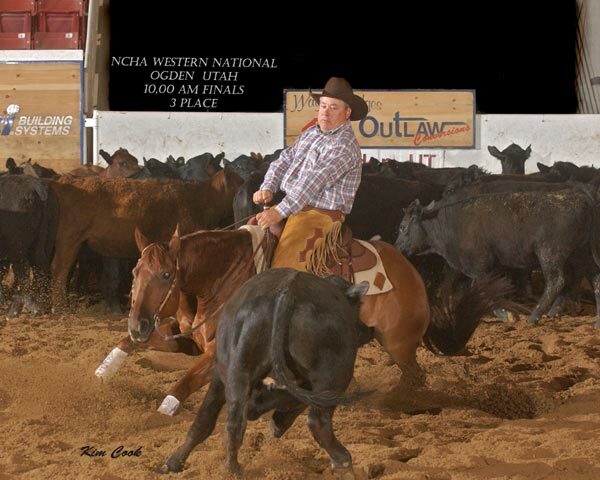 We are heading to Ogden tomorrow for the Western National Finals. We both qualified for the 2000 limit rider. Our stud made the finals in the 10,000 novice horse open. He shows again today. 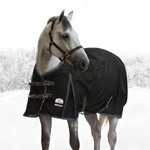 Check out our website at www.freshhorsesfarm.com . We look forward to seeing you soon. Oh, tell Leon that we had a Peptoboonsmal baby this year out of our Smart Little Lena mare. Her name is Boonalicious!" her into the turns, has made a world of difference. The amazing thing is, you taught me this in only 3 hours. I have been going to trainers for 4 months and didn't receive as much in the entire 4 months as I did with you in that 3 hours! By pointing out so many ways for my mare and I to continue to build our relationship and partnership was such a benefit. Although you make your living helping horses with people problems, you clearly love what you do and what a pleasure it is to be around such a positive and motivating person who respects and admires these amazing animals. I just finished watching the video you gave me. All I can say is "AWESOME", I only wish I had watched this video before I got really focused on this sport. What things I could have done and should've done differently are numerous. But with your help I've learned how to approach this sport with confidence in myself and my horse. The light at the end of the tunnel is shining bright, thanks to you. I am looking forward to this weekend's show, so I can go apply all you taught me. I look so forward to working with you again. You have a gift from God that so few people in this world have. I can’t thank you enough. Even though I have many more days to be here, wanted to try & tell you how much the experience so far has exceeded every expectation I had. The expectations were great to begin with, but what I am getting out of it, plus the flat out fun each & every day was something I never guessed would be. Talking to people at home I have used this analogy: Imagine going from Camden SC to Paris. The challenge for all us lucky people with Leon on the podium is to step up to the plate & try not to let him down in performance. Apparently Leon is unable to say anything remotely negative & boy do I need that influence in my life at this particular time. I have worked with many many teachers, albeit English, a few of which I would consider great in all respects but, I am totally honest when I say I have never experienced anyone with the gift & ability that Leon possess. There are people who can teach but are not at all horse savvy, some ride, some don't. Then there are those who are classic riders but are unable to impart their knowledge since most of it is sheer "feel" which they can not translate. Leon has it all. On the video I have & in person, I watch his hands which make me think of a surgeon's hands. Beautiful. The hospitality & camaraderie is unending & I look forward to the remainder of my visit which, without any doubt is only the first in what I truly hope will be a longstanding relationship with both of you. I won't even touch on my feelings for Flash as that would take another page & with your schedule I doubt you have any time at all for email. ~ Marilla Van Beuren from Wellington, FL. I have dreamed of owning and learning how to ride a cutting horse since I was five years old. I am a city girl, and from the moment my Dad took me to see the cutting at the Calgary Stampede in the summer of my fifth year I have pursued the dream. Along the way I have been fortunate to have been around and owned a horse for most of my life. 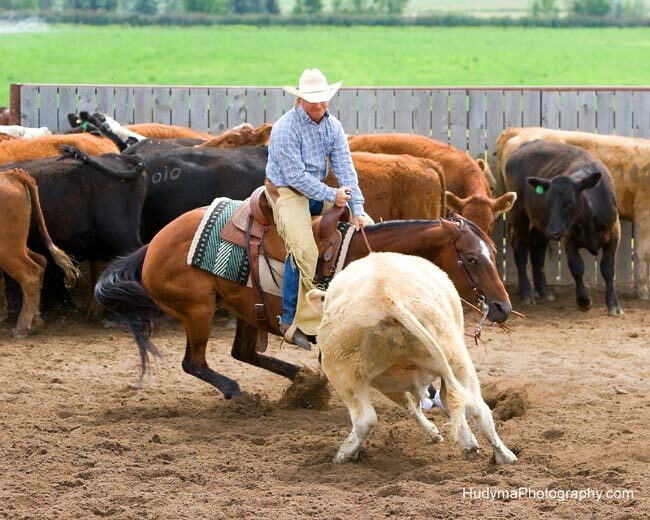 The dream of having a cutting horse and pursuing the sport was always out of reach from a financial and practical perspective. All of this changed in the spring of 2007. 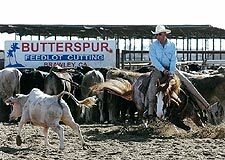 I attended a Leon Harrel clinic in Temecula California, and for the first time in my life, actually rode a cutting horse. In spite of riding for the better part of thirty years, I was terribly afraid of falling off. This was manifest in an attitude of great seriousness and intensity. I’m sure that Leon knew I was scared to death, but he chose to acknowledge my fear by working with my intensity. I was very grateful for his discreet and respectful approach because I certainly didn’t want anyone to know how afraid I was. I was hooked after this clinic and went home resolved to buy a finished cutter that could get me started. There were a lot of obstacles in my way. 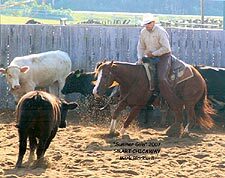 Some were practical like trying to find out who to call to get started and especially trying to find a trainer that was interested in taking on a complete amateur who wanted to buy a cutter AND do the riding. Early on, I discovered that most trainers are very keen to talk to you if you want to send them a wonderful prospect for THEIR TRAINER to ride and show. I found it more difficult to find someone who was interested in taking on a complete amateur and teaching them the sport. 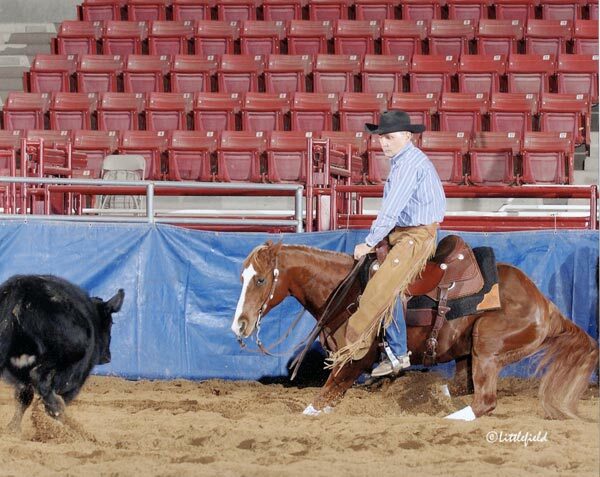 There are very, very few trainers who are truly interested in bringing in new people and teaching them to do the riding and the showing. I am lucky I discovered that Leon is very interested in helping people get started. In April of 2008 I went to Leon’s new location in Springtown. He put me on a pretty snappy horse, and I was very worried about falling off. Before we did any cutting on the first day Leon talked about many things, all woven in and around horsemanship and cutting. And then he said something that just really rocked me. He said: “You can let life touch you, or you can let it kill you. No matter what happens to you in life, you can make that decision”. I have a long ways to go to get to a point where I am not afraid every time I get on my mare to cut, but that one comment from a man who has processed and understood life very well has taken me well down the path. So, cutting horse trainer extraordinaire? Yes. Talented teacher? Yes. Superb horseman? Yes. Compassionate respect for these beautiful creatures? Yes. But most of all and most telling of all: a profoundly wise and gentle human being. "Leon Harrel!! What a name, what a man, and what he stands for! My husband and I have always had horses. One day I came home with a cutter!! We decided that we both wanted to pursue cutting and needed a trainer. My husband said lets go to a clinic with "Leon Harrel". We have known Leon for four years now. Leon doesn't look at you as just another client, or another person rolling through. 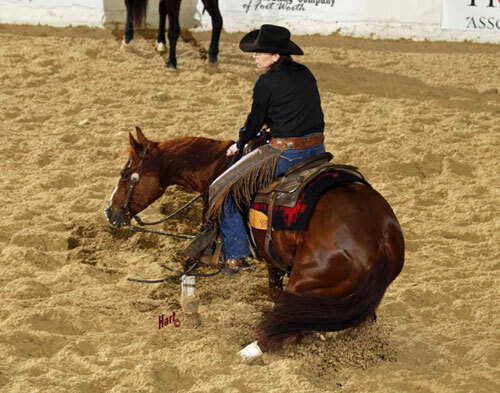 Your horse is not just another horse in the barn that is replaceable, you both matter to him. 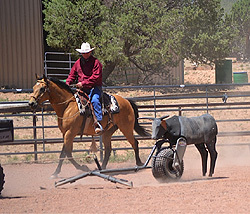 He knows what it takes to train your horse, and keep your horse tuned up. Through learning of the "Cutting World" I have seen trainers that can train horses, trainers that can train people, and Leon has both qualities. His personality and positive attitude make learning come naturally. During the day when you repeat the same mistake a hundred times; then you finally get it, he will always end your day on a good note. I feel that he has touched our lives in a positive way as a great instructor and life- long friend." Having the right start allows you to grow at a much faster pace. 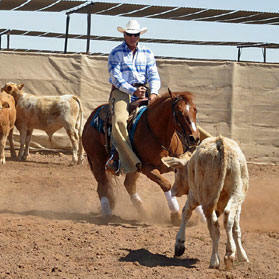 Leon provided me with an extraordinary level of skill development in my two visits to the ranch. I have since won numerous classes and could not be happier. People ask me at the shows, "how long have you been riding" and when I tell them it’s been about 4 months, they are astonished. It takes most people many years to gain the knowledge I have acquired in such a short time! I just wanted to thank you for 2 of the best days I have experienced in quite some time. I so enjoyed riding all the horses and am still analyzing the different feel of each one. The power behind Misty, the quickness of Jesse...but my favorite was the last one I rode. I believe his name was Zebb? If welcomed, I would like to attend another couple of training sessions in 2009. You both have truly made a mark on my life for allowing the opportunity to nurture a passion that I hope to be in full swing in a few years. "I enjoyed my time I spent with both of you. I learned so much from Leon and I will never be able to thank both of you enough for being part of my life." "Leon adjusted my self confidence to an awesome level and it has never slipped. Working with him is a pleasure as he is always helping you to focus on what you do right and doing more of that. He is calm and focused, keeping your self confidence to a powerful high." "I did tell my dear friends what a good teacher you are and how my family and I thoroughly enjoyed our time with you. I also stressed your positive approach and how much fun we all had regardless of our low skill levels at riding. I also emphasized how the best riders and trainers consult regularly with you. If I can do anything to help you with testimonials, letters, or just with this lead, please do not hesitate to let me know. It is fun to recommend you since I know that everyone who follows the advice is guaranteed to have one of the best experiences of a lifetime.